News - On 27th June, 2010 NVIDIA released CUDA 3.1 and on 21st July, released Parallel Nsight 1.0. The download sites for CUDA Toolkit 3.1 and NVIDIA Parallel Nsight 1.0 are here and here, respectively. I recently wrote a small piece of code using CUDA to solve a 1D heat transfer problem. The heat transfer happens along the material whose properties are density ρ = 930 kg/m3, specific heat Cp = 1340 J/(kg K) and thermal conductivity k = 0.19 W/(m K). 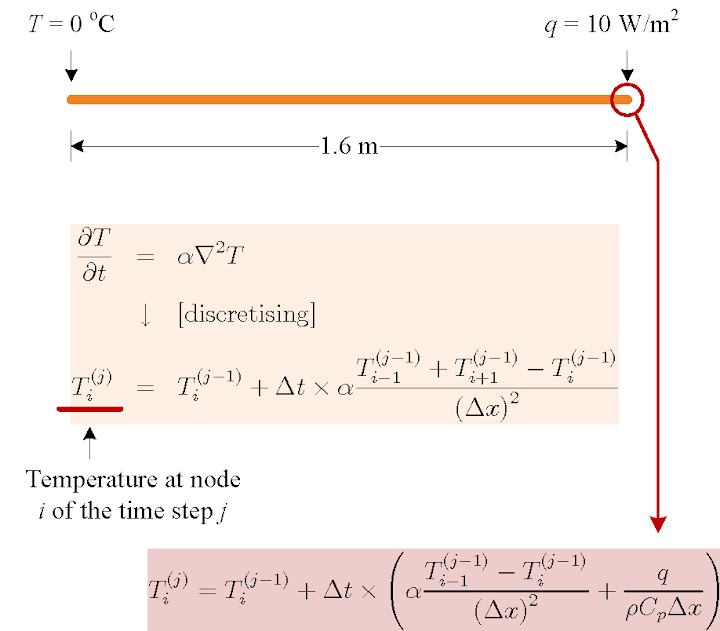 As shown in the figure below, the computation region is illustrated by the thick orange line; the total distance is 1.6 m. There are two boundary conditions attached: at the left end, the temperature is fixed to be 0 oC, while at the right end, a heat flux q = 10 W/m2 is imposed. 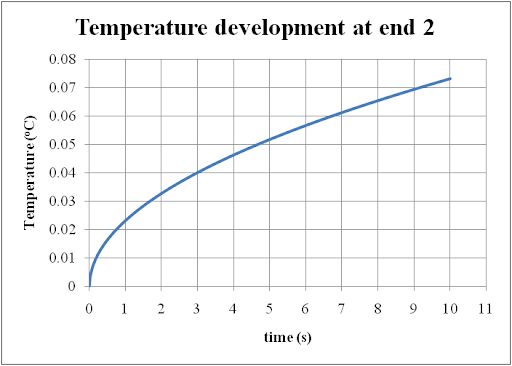 If the initial temperature for the entire region is 0 oC, I want to calculate the temperature distribution along the region after 10 seconds' heat propogation. in which α is the thermal diffusivity. The interesting thing concerns us is the code efficiency. Once again, I used CUDA 3.1 on my GeForce 9800 GTX+ and a single core of the Q6600 CPU, and the time durations elapsed on the GPU and the CPU for the same calculation are 1.43 s and 5.04 s, respectively. The speedup is 3.52. This speedup value is not that attractive, but it is actually supposed to be much higher when there are much more discretised elements. I didn't find an easy way to paste source code onto the blog. If you are interested, please leave a comment and the related code can be shared in any way. News - The source code can be found in the new post on porting this CUDA program onto Mac OS X. Can you please send me this code...I am experimenting with solving PDEs with CUDA and this will really help me. May I ask you to share your code? Hi, thanks for the post. I'd also be interested in the code. Can you perhaps paste it here: https://gist.github.com/ ? Thanks for this website :) I am interested in sharing the code and however due to a recent change of computer I need to re-find that. 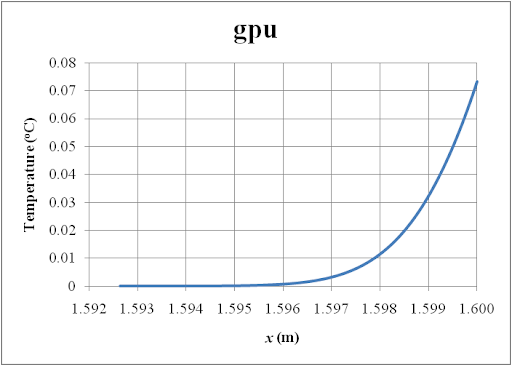 Hi, I am very interestend in the code, this is one of the nicest tutorials on PDE on GPGPU i found so far.If you can please send me the source code i would appreciate it. Hi. Could you please send me the code at my email: umair.khan@aau.at. This post is very interesting, I am into a similar project, where I would like to use the CUDA platform to speed up my heat transfer and fluid flow analysis. I would like to view the code and understand the discretising process. Hello, I'm a student studying FDM with CUDA in Korea. 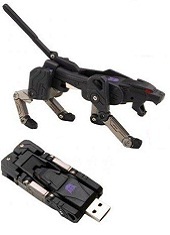 Can you please send me this code? Your code will really help me.